Welcome to Sunshine Coast Pumps, your local Pump, Filtration, Irrigation and Sterilization specialist servicing South East Queensland and beyond. With over thirty years experience in pump selection, installation and repairs within Australia and overseas, I am confident I can assist you with your needs. I provide solutions for commercial, rural and domestic pumping, filtration and irrigation, including system design, construction and installation. If you have a pumping, filtration or irrigation need, I can supply a cost effective solution. If you have a pumping need, be it a domestic project or a larger commercial pumping project I can complete a project audit, design, construct and install as required. I supply new and reconditioned pumps and have reconditioned units in stock. I service the Sunshine Coast, South East Queensland, Central Queensland and beyond for commercial projects. If you have a filtration or sterilization need, domestic or a larger commercial project, I can complete a project audit, design, construct and install as required. If you have an irrigation need, domestic or a larger commercial irrigation project, I can complete a project audit, design, construct and install as required. 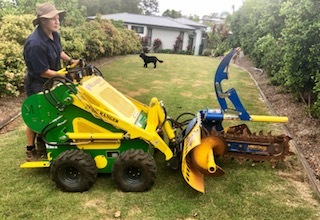 Available for hire with or without an operator is a mini loader with a 4 way bucket, trencher and post hole digger suitable for suburban blocks to small acreages. 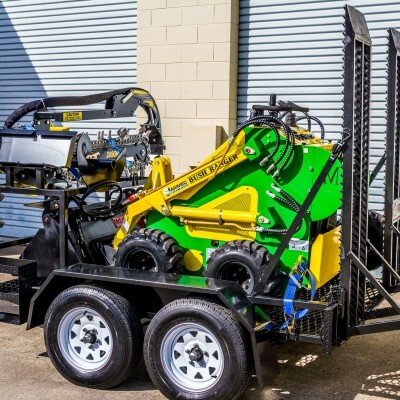 The digger will fit through a 1100mm gate, comes on a trailer with all attachments and can be delivered to site.